Shows around the country, feature women artists and feminist icons, including our own Helen Zughaib. Helen Zughaib, Generations Lost. Photo courtesy the Islamic Art Revival Series. “IARS Women’s Invitational Exhibition 2017” at the Eiseman Center of Performing Arts and Corporate Presentations. This Women’s Invitational features the work of 10 minority women artists, all first generation Americans. 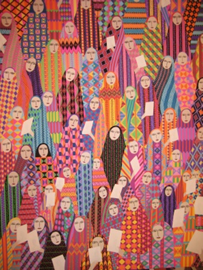 The works reflect these women’s strong bonds to their heritage and to their experiences living in the US, with unique techniques, narratives, and viewpoints. The artists, originally from Iran, Lebanon, Japan, Pakistan, and Saudi Arabia, present a wide variety of themes. The Women’s Invitational this year includes the work of Nida Bangash, Sarah Ahmad, Sue Ewing, Saberah Malik, Nina Gharbanzadeh, Hend Al Mansour, Roya Mansourkhani, Naoko Morisawa, Helen Zughaib, and Sudi Sharaf. Date and time: Through March 26. Monday–Friday, 11 a.m.–6 p.m.